Later by night, the number of water tanks and fire engines deployed at the site increased to ten. Fire breaks out in forest area near Goregaon, firefighting operation underway. Photo Credit: ANI. 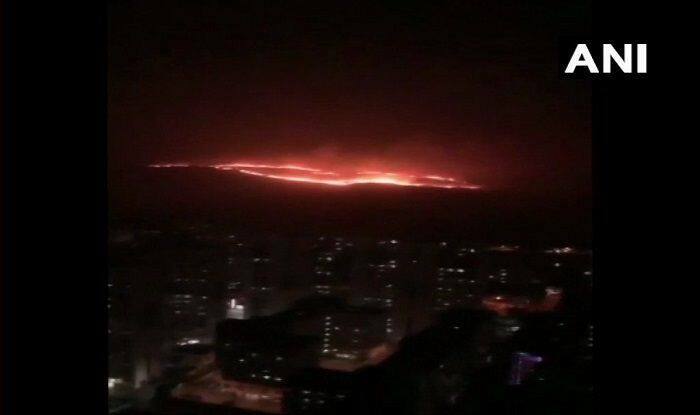 Mumbai: A massive fire broke out in a forest area opposite Gokuldham near Goregaon at Mumbai’s Aarey Colony on Monday evening. The Fire Brigade from the city declared the degree of fire as Level 2. According to a report by Times of India, four fire engines were initially rushed to douse the flames. Later by night, the number of water tanks and fire engines deployed at the site increased to ten. Fire brigade control room received the information about the blaze at 6.30pm, the official said. The blaze which was first noticed on one of the forested hills in Habalpada, near the Film City, quickly spread to an estimated four km area near Goregaon. Various agencies, including the police and the forest department officials were informed about the fire, stated an official adding that efforts are on to put out the flames. More details are awaited. The fire erupted in the precincts of the Sanjay Gandhi National Park (SGNP) region. The region is rich in flora and fauna including leopards, peacocks, deers, hogs, besides a variety of insects, birds and plant life.